Fans at San Diego Comic Con get the first look at the new characters. 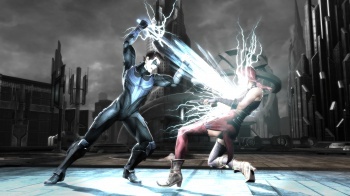 Upcoming fighting game Injustice: Gods Among Us, developed NetherRealm Studios (of Mortal Kombat fame), just got two more iconic DC Comics characters added to its roster: Cyborg and Nightwing. The longtime members of the DCU join a cast of classic heroes and villains featuring Batman, Harley Quinn, Solomon Grundy, Superman, The Flash, and Wonder Woman. While they both utilize gadgets, Cyborg also has robot-related super powers, which should make for an interesting fighting style. After getting his superhero start in the Teen Titans, Cyborg was reestablished as a founding member of the Justice League during DC's 2011 relaunch. Nightwing, once known as Batman's ward Robin, is also a former member of the Titans, as well as current crime-fighter and occasional Batman. Gamers might recognize him from his cameo in 2011's Batman: Arkham City. The two were friendly during their time as part of the Teen Titans, so it makes sense that they would join the cast of Injustice together. The characters are currently playable at San Diego Comic Con, so those of you lucky enough to be there can check out the latest additions to the comic-inspired fighter. Injustice: Gods Among Us is set to launch for the Xbox 360, PlayStation 3, and Wii U in 2013, and we'll be watching to see what other DC characters make the cut. My money's on Matter-Eater Lad.